For version 8.3, we've added two further features that make ResourceSpace even more helpful for users. The first is a watched searches function, which allows users to subscribe to particular searches and receive a notification when a new match occurs. This way, they will always be in the know when a relevant asset is uploaded or updated. In addition, we've added an advanced workflow plugin, which enables core users to adapt standard workflow processes to the bespoke needs of their organisation. It allows for a great deal of control over asset processing, including who can assign and edit workflow action. 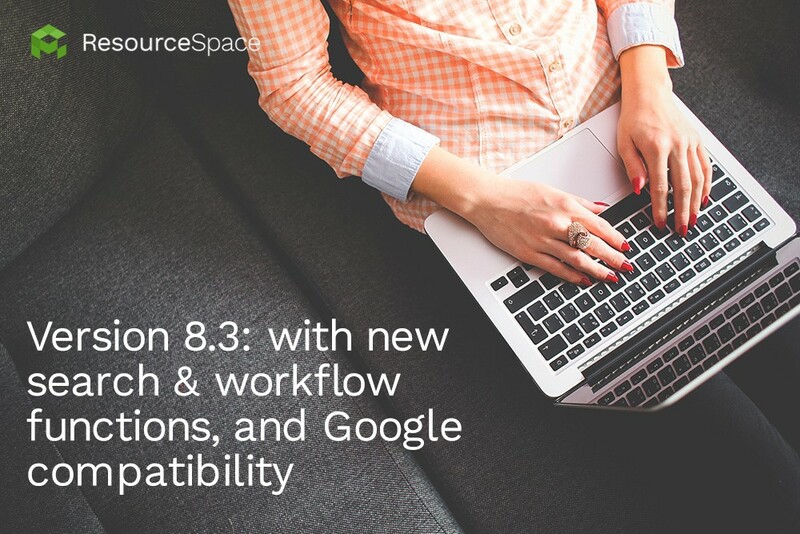 Another feature of ResourceSpace version 8.3 is that our DAM software can now be accessed using your Google account, thanks to our new Google OAuth plugin. ResourceSpace version 8.3 users can also benefit from a new function that allows resources to be shared across social media sites including Facebook, LinkedIn and Twitter. In addition to adding new functionality, we've also made some updates so that existing features are even easier to use. To experience how our refined ResourceSpace platform version 8.3 can help your organisation manage digital media assets more effectively, try our free trial system. For full information on the features and benefits of our DAM software solution, visit our product features page.